(TibetanReview.net, Apr07’19) – China has jailed a Tibetan man for 18 years sometime last year after he staged a lone protest in front of the Potala Palace in Tibet’s capital Lhasa and also recorded a video message announcing a ‘campaign for world peace’ on Jan 28, 2018. And it has refused say why he has been jailed, claiming it’s a state secret, reported voanews.com Apr 5. Lodoe Gyamtso, 57, had already served a total of 23 years in prison from two previous convictions. The report cited an official at the People’s Middle Court in Nagchu City, Tibet Autonomous Region, as saying when asked about the case, “This is something that is a state secret”. His video message, recorded on Jan 28, 2018 itself, was stated to have been released a through social media. His wife, Gakyi, who was stated to have recorded the video, was reported to have been given a two-year jail sentence. The couple was believed to have been tried and sentenced sometime in Oct-Nov 2018. 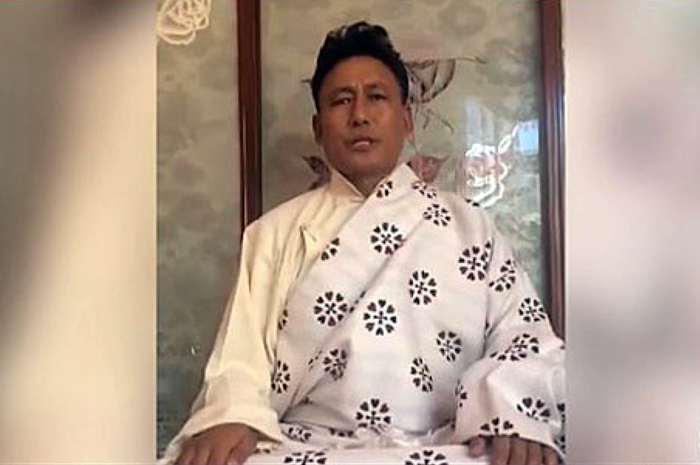 Lodoe Gyamtso was stated to have been previously released in 2013 after serving a 21-year jail sentence in Lhasa. He was reported to have been detained for two more years in 2015 after he staged a protest. His current whereabouts remain unknown.